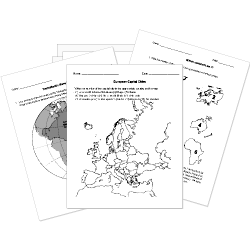 You can create printable tests and worksheets from these Bodies of Water and Continents questions! Select one or more questions using the checkboxes above each question. Then click the add selected questions to a test button before moving to another page. What is the landform, or body of water, that is partly enclosed by land, and is usually smaller than a gulf? The river begins in Minnesota and flows through 10 states before reaching the Gulf of Mexico. Lake Titicaca is in which mountain range? Manitoulin Island in Lake Huron is the largest fresh water island in the world. How many continents are on Earth? The is the largest ocean. What is the name of the sea located between North and South America? What is the largest inland body of water, or lake, on Earth? The is the largest inland body of water on Earth. The Ocean surrounds Antarctica, and was named in 2000. What is the name of the tallest free standing mountain? What is the oldest mountain range? On which continent is the smallest mountain found? Which river runs through the most countries? What is the world's largest sea?